Sanding is a tedious and time-consuming task the few people actually enjoy. However, if you skip sanding on any of your projects, you’ll likely end up thoroughly disappointed. Fortunately, though, power tool manufacturers have given ear to many of our complaints and have engineered an effective solution to the sanding issue. There are a number of different power tools on the market today for the very purpose of abrading wood, metal, and even laminate. But, the most sought after of them all is the belt sander. The belt sander can be thought of as a “workhorse” among power tools. The sander is tasked with the job of grinding through wood and making an otherwise physically tedious job relatively easy and quick. In fact, once you have used a sander for one project, you’ll likely not be able to go without one. If you have never used a belt sander, it is important to you spend some time familiarizing yourself with how to use a belt sander before you make your first attempt at a project with one. And, if you are in the market for one to add to your tool collection, you’ll want to consider a few questions that will help you decide what is the best belt sander for you and the many projects you’ll be doing with one. 1. What is the best belt sander? 2. What is the difference between a belt sander and palm sander? 3. What types of belt sanders are available? 4. What are the primary uses of a belt sander? 5. 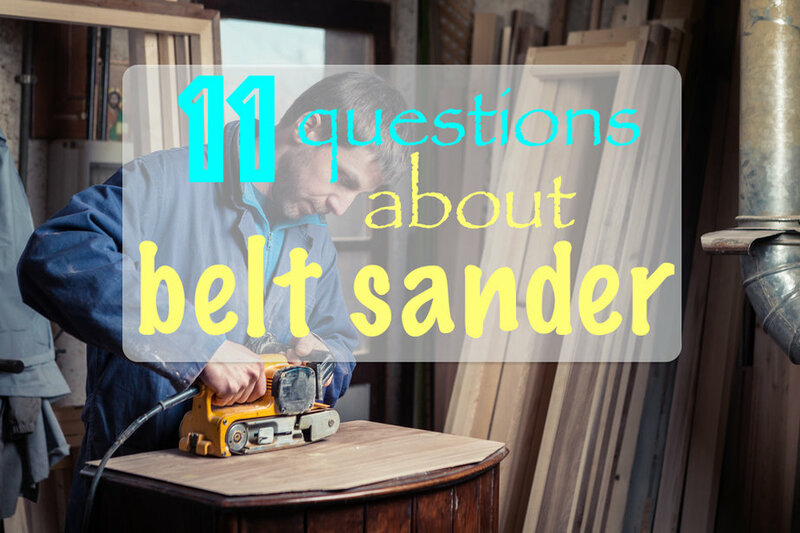 What features should I consider before buying a belt sander? 6. How do weight and power affect sanding? 7. What size and shape are best in a belt sander? 8. What speed should I look for in a sander? 9. How does the belt adjustment affect my sander choice? 10. Is a dust collector really that important? 11. What type of handle is easiest to use? This question is asked by many a craftsman. And for as many people ask it, you’ll probably get as many different answers. To choose the best belt sander for you, you really need to consider a few simple factors – motor, belt size, speed, weight, and noise level. Comparing these components between brands will help you assess your options and pick a sander that fits your project and budget needs. There are numerous projects that call for sanding a piece to make it smooth. While there are several different tools available to do the job, few can stand up to the power and finesse of a portable sander. That being said, there are different sander options available. Two of the most common sanders are a belt sander and palm sander. A belt sander uses a continuous belt that is looped around two to three pulleys. A drive pulley advances the belt while the idler pulley guides it. Most models also have an adjustment feature that holds the belt at the center. This type of sander is best suited for removing material aggressively and rapidly. A palm sander or finish sander is fashioned with a square pad of sandpaper attached with special clamps to the bottom of the sander. The motor rotates the pad in small circular orbits. This option is best suited for finish work and sanding corners and is considered one of the most economical options as it requires less sandpaper to function. Belt sanders can be categorized into two primary options – in-line belt sanders and transverse belt sanders. An in-line belt sander has a low profile design with a boxlike casing and low center of gravity. These design elements make it less prone to tipping, making it effective for use in projects that involve anything from removing nicks and scratches to smoothing or flattening panels. This sander is designed with a motor that is parallel to the length of the sanding belt and typically includes a metal front roller and a rubber drive roller. With its flat top, this sander can also be used upside down on a workbench as a stationary sander. A transverse belt sander has a motor that is situated transversely above the belt and across the width of the machine. This configuration drives more power through the drive belt. With a number of different features, transverse belt sanders are generally considered easier to handle than their alternatives. Likewise, these sanders are typically a bit heavier and sand more aggressively, making them ideal for heftier projects. While a belt sander is not a replacement for a hand plane in any way, if your main goal is to flatten out panels or expedite the process of prepping a work surface, you can get by with the best belt sander. Before you invest in one, though, you’ll want to consider a few key features, including the weight and power, size and shape, belt adjustment, dust collection, and comfort options of the sander you are considering? In most cases, you don’t need record-breaking power to complete most jobs. So power is not really top priority. Most models range in amperage from 6 to 10 or over, so just consider this as you factor cost. As far as weight, you’ll want to consider how many and what type of projects you typically do. A 10 pound or less machine is a lot easier on the arms than a 12 or 15 pound unit. Most sanders are categorized into two sizes: 4” x 24” and 3” x 21”. The latter provides the best combination of speed, balance, and power, even for the amateur sander. Investing in a variable speed sander is often a wise choice, as it opens up the possibility for more projects. However, this feature will likely cost you additional money in your initial investment. Adjusting and changing the belts is another consideration. Sanders that facilitate quick, easy belt changes make for faster projects. So, you’ll want to look for this as an option on any sander you are considering. If you’re doing a variety of indoor sanding projects, an effective dust collection option is an essential component. It reduces the mess and makes clean up much simpler. In many cases, the ease of clean up that a dust collector offers is well with the added cost. You simply can’t overrate comfort when choosing a model, particularly if you’ll be doing several projects. This aspect is mostly subjective; however, the size and style of the handle has a lot to do with comfort. Take some time to get a feel for the tool before jumping into a purchase. Everyone prefers a bit of a different style, but making sure the handles are adequately spaced for you is the main concern with ease of use and comfort. A belt sander is an effective tool to have in your workshop. Knowing how to use a belt sander and investing in the right option for you will not only save you time but also a lot of hard work when it comes down to it. Before you make your investment, be sure to consider these questions and weigh your options so you get the best deal and the right tool for you.